In the 1st 5 months of last year under then President Obama, American manufacturers lost 24,000 jobs. Now n the 1st 5 months of this year, businesses large and small have created more than 600,000 new good-paying jobs, including 55,000 new jobs in manufacturing. This is a stark difference between President Trump and the former administration. Going back decades, manufacturers have invested in jobs and factories in other countries but this year, company after company are making record investments worth billions of dollars in the USA. And now, American manufacturers are more optimistic than at any point in the past 20 years thanks to our President’s direct actions, American manufacturing is getting stronger every day. This week, the Supreme Court’s decision to uphold an Executive Order on travel affirms the President duty to protect our Homeland and keep America safe as granted by the Constitution. “As President, I cannot allow people into our country who want to do us harm. I want people who can love the United States and all of its citizens, and who will be hardworking and productive,” said President Trump. The President’s number one responsibility as Commander-in-Chief is to keep the American people safe. Our President is committed to that responsibility. Wednesday, President Donald Trump and Vice President Mike Pence welcomed the 2016 World Series Champions, the Chicago Cubs, to the White House. The team brought the Commissioner’s Trophy and participated in a meet and greet with the President. 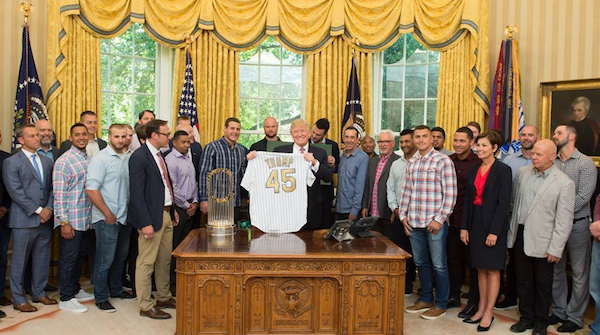 The team gifted President Trump with a customized championship “45” jersey, as well as a “45” scoreboard panel. 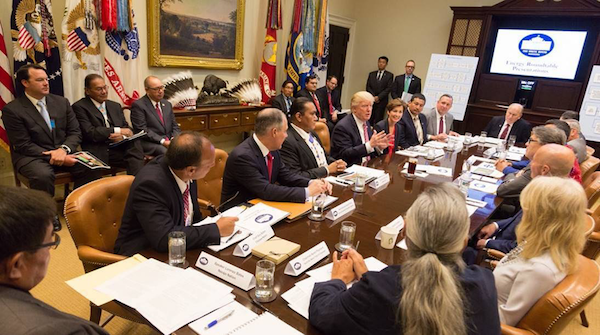 President Trump is dedicated to unleashing American energy as he met with Secretary of Energy Rick Perry, Governors Paul LePage, Kim Reynolds, Pete Ricketts, and Bill Walker, along with State and tribal leaders from around our great country. In the past 5 months, our President has taken action in to remove unnecessary and burdensome roadblocks that would have prevented the United States from achieving energy dominance and independence. The United States energy industry is critical to the economy and future economic growth. While Americans have been told they would have to settle for declining energy resources, innovation and new technology have opened trillions of dollars of energy for development. President Trump is following through on his promises to the American people. 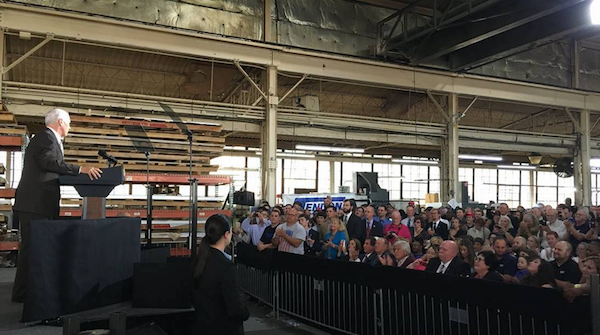 Vice President Pence visited Tendon Manufacturing in Cleveland, Ohio this week. Nearly 30 years ago, Tendon Manufacturing got off the ground with only 6 employees. Today, this company employs more than 75 people in good-paying manufacturing jobs. This business is what America is all about. Which is why small businesses just like Tendon Manufacturing need relief from the burdens of Barack Obamacare. Vice President Pence explained that the last statewide health insurer announced it will pull out of Barack Obamacare in Ohio by next year. Now at least 18 counties in Ohio and 12,000 Ohioans or more will not have any insurance to choose from at all under Barack Obamacare. Ohioans and Americans deserve better, and Ohio really is a case study of Barack Obamacare’s collapse. History shows that free market competition and solutions will work to lower costs and improve benefits. And with your help and with the help of Congress, we are going to repeal and replace Barack Obamacare with better options and care for Americans. Under President Donald Trump’s leadership, market confidence and American manufacturing are back. Our President has signed more laws to slash through red tape than any President in American history to save American business up to $18-B a year. That’s money they can invest in their workers and their futures. With such investment, businesses, small and large, are now better positioned to grow and prosper without the government getting in their way. And Barack Obamacare’s collapse will not bring them down any longer. But no business can prosper in an unsafe environment. 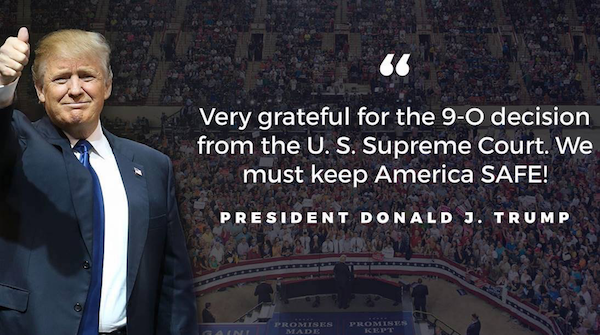 This week was a victory for all Americans as the Supreme Court ruled in favor of the President’s constitutional authority to protect The Homeland. Our President is and will remain committed to Keep America Safe.